I’m excited and proud to have been chosen to contribute to this best-selling series, which has featured luminaries such as Marianne Williamson, Danielle La Porte, Joe Vitale, Bob Doyle, and many more. Being published as a contributing author in this book is a wonderful personal manifestation. And the topic of creating loving, soulful relationships is close to my heart. I’m thrilled to share my chapter “The Path of the Heart” with you all. 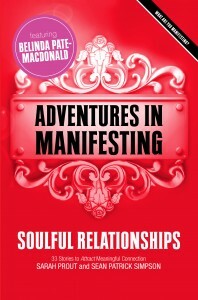 Whether you want to meet your soul mate, understand why you attracted certain people into your life, need to heal emotional pain, or want to learn how to connect on a deep soul level with your higher self, then this book will illuminate your way. You’ll witness how others bravely followed their hearts to allow love to manifest through amazingly powerful lessons. 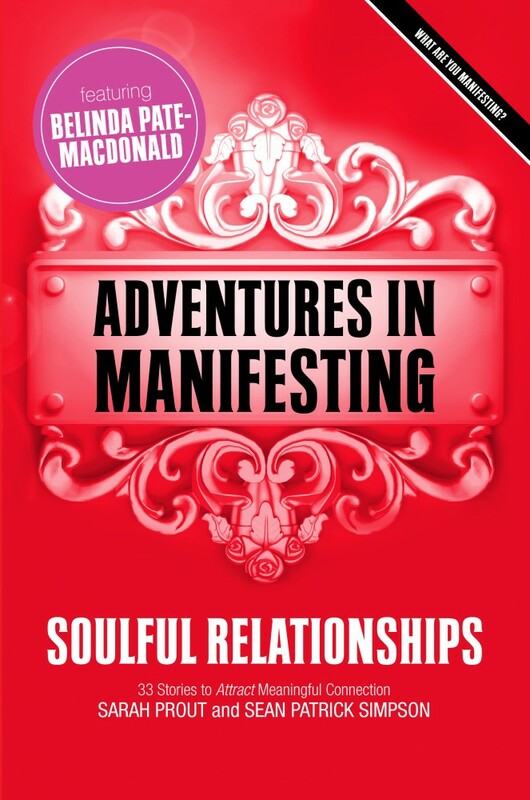 Adventures in Manifesting – Soulful Relationships will take you through a deep journey of your own as you find meaning and connection with all who have shared their hearts so openly. Do you ever feel like someone is pulling on your heartstrings? Perhaps it’s a memory you’re holding onto, or you unconsciously left a small part of yourself with a past love. This healing meditation allows you to reclaim the whole of your heart by transforming past promises, hurts and expectations that can hold you back by invisible cords to old relationships. Top up your heart with all it can hold and be free to experience more connected and soulful relationships. This is a beautiful meditation I created to accompany my book, and is included as a free MP3 download, with your book purchase. These modalities are both incredibly powerful energy healing tools in their own right. They work on your subtle energy bodies to release old patterns and create a new matrix of positive alignment with the qualities of the essences chosen. An essence blend is a wonderful way to continue your healing after we’ve worked together in a session. It will support your unfolding process, reinforce the positive energy shifts you’ve made and open new possibilities. Each blend is intuitively selected in alignment with your healing journey. Please note: essence blends are only available to clients who have already worked with me in one of my sessions. Want to gift a sacred soul experience to someone you love? It’s simple to give a gift voucher for the session of your choice. 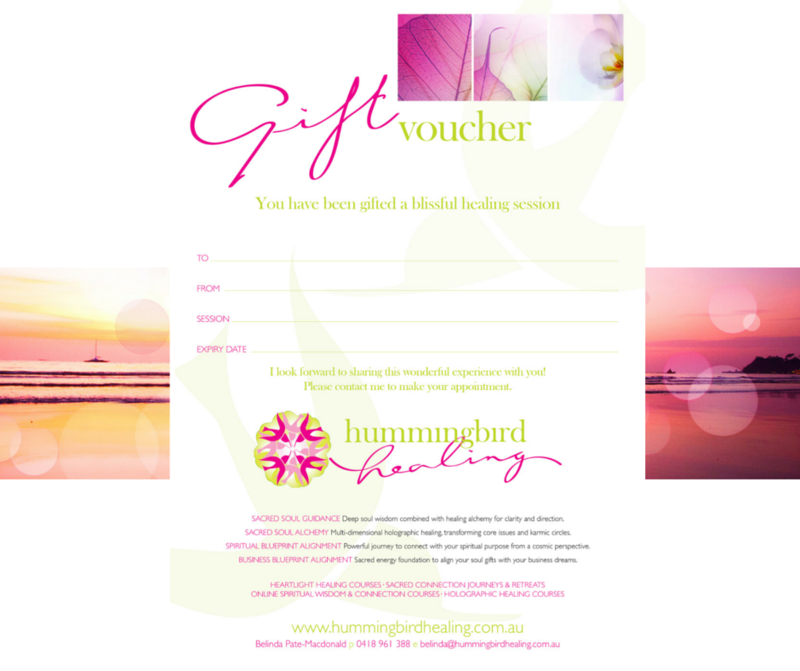 Click on the buy now button below to purchase, and I’ll be in touch within 24 hours to personalise your gift voucher. You’ll receive a customised PDF which you can print out or email to your loved one. Your gift voucher is valid for 6 months. If you’d like to know more about each session, click over to my one-on-one sessions page for more details.